Many homeowners don't think about the maintenance of a washing machine until something goes wrong. But taking the time to familiarize yourself with the following easy steps can not only improve the lifespan of your washing machine, it can also save you time and money from costly cleanup from possible water damage. There are basically 9 steps for washing machine maintenance. When the washing machine is installed, or afterwards if you already have it installed - add a drip pan underneat the machine. This is extremely important if your machine is on the 2nd floor! Make sure the machine is sitting on a sturdy, level surface. If you have a newer model - you most likely will get an "alert" every now and then to "wash" your machine. Heed these alerts (just as you would when it comes time to change your refrigerator's water filter). This wash rinses away any soap residue and other buildup in the machine. You can use commercial washes recommended by the manufacturer of your machine or you can use a solution of hot water, vinegar and baking soda. A little "how to" on this below. There should be at least 4 inches between the wall and the back of your washing machine (to prevent kinking of the hoses). Every 3 - 5 years, check the water hoses in the back of your washing machine. If you notice any bulging, cracks, fraying, etc., replace them to help prevent any water damage from a malfunctioning hose. Clean the lint filter. Yes, there's a lint filter in your washing machine, not just your dryer. The location will differ between manufacturers and models so check the paperwork that came with your machine or find the information online. Between washes keep the lid open to help prevent musty odors and mildew. On front loading machines, wipe down the rubber seal around the door before every wash or after every wash.
Use the right kind of detergent and don't use too much detergent. All this does is leave residue in the machine and on your clothes. Never stuff your washing machine - in other words do not overload it. If you have something bulky to wash like a comforter don't put anything else in there with it. What Is The Best Way To Clean A Washing Machine? As I mentioned earlier, if you have a newer model washing machine, you will probably be alerted as to when to "wash" your washing machine. If you don't have the alert, I would recommend to do so monthly or at least every other month. You can clean your washing machine using a commercial cleaning product made for that purpose or you can use just a few things that you probably have in your pantry, white distilled vinegar and baking soda. Here's how. Can Vinegar Damage Your Washing Machine? If you use vinegar in your washing machine as I described above - it will not damage your washing machine because it is combined with the hot water in the cycle and is therefore diluted. But if you try to use vinegar as a fabric softener, it will destroy the rubber seals in your washing machine. 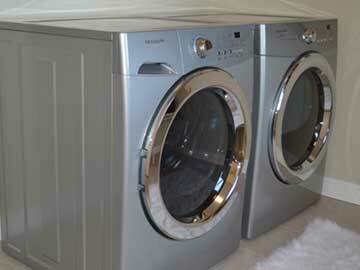 If you have any questions about washing machine maintenance, call Atlantis Plumbing today at 770-505-8570. We are available 24 hours a day, 7 days a week.